Pembrokeshire People's Assembly to hold 'mass rally' against austerity. 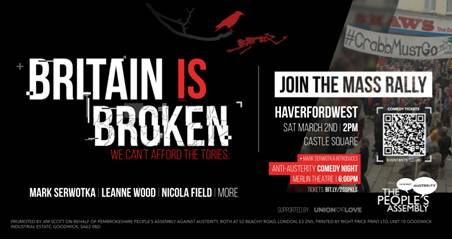 The People's Assembly Against Austerity's national tour, themed; 'Britain is Broken - We Can't Afford The Tories' will be visiting Haverfordwest on March 2nd for the West Wales leg of it's tour. Speakers at the 2pm rally on Castle Square will include Leanne Wood, former Plaid Cymru leader and Mark Serwotka, President of the Trades Union Congress (TUC) and Nicola Field who was one of the original LGSM activists as featured in the film PRIDE. There will also be speeches from Disabled People Against Cuts (DPAC), Women Against State Pension Inequality (WASPI), Anthony Slaughter, Wales Green Party Leader, Stand Up to Racism and more. The People's Assembly's National tour which will visit towns and cities all over Britain in coming weeks will focus on the damaging effects of austerity which they say is now cutting deep into every layer of society. 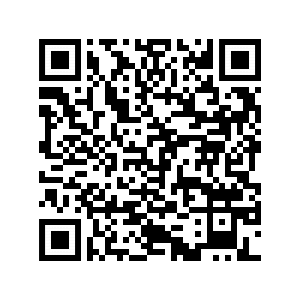 The tour will highlight the core domestic policy themes of health, homes, jobs and education. Pembrokeshire's leg of the tour will focus on Universal Credit roll out and the poverty, homelessness and anxiety which they say it brings. 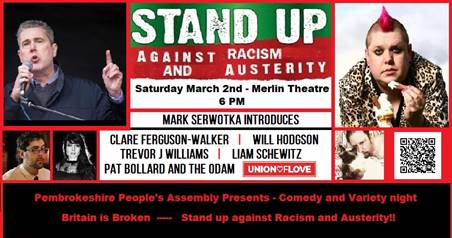 As Part of the day's proceeding the group have also teamed up with Pembrokeshire Stand Up to Racism to put on a Comedy and variety night which will be themed; "Stand up against racism and austerity" and will take place in the Merlin Theatre at 6pm. Mark Serwotka will host the evening which will feature stand up comedy from Wil Hodgson & local comedian Clare Ferguson-Walker as well as Trevor J Williams and Liam Schewitz from South Wales. There will also be music from Pat Bollard the well known busking band who gained fame with their song 'Millionaires'. Union of Love - Street Performance group - will also be bringing street performance to the theatre with a moving performance on poverty in Britain. 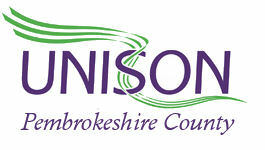 As you know UNISON has continuously fought against austerity and its impact on jobs, terms & conditions. As such UNISON Pembrokeshire County Branch is proud to be officially supporting the rally and we encourage our members to turn out in large numbers.